Kalhana’s Rajatarangini is a work relating the Parampara of kings that ruled Kashmir. It is written by Kalhana in the form of poems in eight chapters termed Tarangas (Waves) describing the lives and exploits of these kings and the conditions that prevailed in Kashmir during their times. This way it contributes to the study of history of that region during those times. This study is based upon the book written by M.A.Stein, who has translated this work in English from the Sanskrit original. Gonanda, after his grand father. Neither the Kurus nor the Pandavas took this infant king’s help in the Kurukshetra war. 35 kings after him were immersed in the oblivion Lava then became the (36th ) king. He founded the town of Lolora. He gave the Brahmanas an agrahara on the banks of Lidari; This Lidari is modern Lider, one of the principal tributaries of Vitasta, flowing near Anantnag. (This Srinagari at the site of present village Pandrethan ( K’s Puranadhishthana) on the right bank of Vitasta, some three miles above modern Srinagar.-M.A. S’s footnote) This sinless prince built a stone enclosure for the shrine of Vijayeswara and two temples near that of Vijayesa, called Asokeswara..
Damodara II succeeded him after his passing away with his queen. He too was an ardent Shiva Bhakta. Vaishravana (Kubera) himself made friendship with him. He constructed the long dam Gudda setu. On one occasion when he refused to give alms to the Brahmanas, he was cursed to become a Sarpa On pleading with them for mercy they told him “when you hear the whole Ramayana recited in a single day, then the curse will cease (i. 166). Three kings followed this Damodara They were called Hushka Jushka and Kanishka .who built three towns in their names as Hushkapura, Jushkapura and Kanishkapura respectively. These three were from the Turushka race. During the powerful reign of these three kings, Kashmir was to a great extent in the possession of the Bauddhas. This was 150 years after the Nirvana of Buddha. At this point of time Nagarjuna a Bodhisatva, lived in this part of Kashmir, residing at Sadarhadrana. (i. 173). Abhimanyu who followed built an Agrahara and a Shiva temple. Under his instructions, Candracharya and others brought the Mahabhashya (i. 176) which was at that time difficult of access, into general use and composed their own grammar. When the traditional customs of the land are broken the Nagas who had lost their accustomed oblations, sent excessive snow in the region and thus destroyed the people. (i. 179). 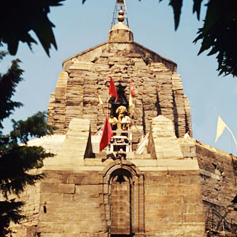 When there was deep snowfall, causing distress to the Bauddhas, the king recided for six months of the cold season in Darvabhidara (lower hill region between Vitasta and chandrabhaga rivers) Gonanda III ascended the throne at that time and reintroduced the pilgrimage, sacrifices and other worship in honour of the Nagas as they had been before. (i. 185) Vibhishana I succeeded Gonanda III and he was succeeded by Indrajit first and then by his son Ravana who worshipped the beautiful Vatesvara Linga. Ravana’s son Vihishana II came next and ruled Kashmir for thirty five and a half years: His son Nara (bearing the name Kinnara) succeeded him. Siddha followed Nara. To be succeeded by his son Utpalaksha and then by his grandson Hiranyaksha. Their reign lasted about sixty eight years. Hiranyaksha’s son Hiranyakula ruled then for about sixty years, and his son Vasukula for sixty years. Mihirakula, his son, became king then. He was of a violent character and was over ruled by hoardes of Mlechchas. Mihirakula made an expedition to Simhala (Ceylon) and replaced that king by another. On his return, Mihirakula scattered the Chola, karnata and Lata (central Gujarat) kings. Mihirakula founded the shivashrine in Srinagari called Mihiresvara and a large town called Mihirapura.. He made amends for his cruelty by gifts of Agraharas. He ruled the land for seventy years. After the death of Mihirakula, his virtuous son Baka was crowned by the subjects. He built a Shiva temple for Bakesa and ruled the country for sixty three years. Kshitinanda, Vasunanda, Nara II, Aksha and Gopaditya became kings in succession after him. His son Gokarna ruled for about fifty eight years. He was followed by Narendraditya and then by Yudhishtira I, In whose period, the affairs of the country soon fell in to disorder. His wicked councilors made the rulers of neighbouring countries eager to seize the kingdom (i. 361) Finally, he was made to leave the kingdom. Thus ends the first Taranga.